In the week ended 27th September 2015, AcuComm added new or updated projects to our Business db database, worth an estimated US$4,023 million and reported waste capacity of 5.2 million tonnes. This takes the total estimated value of projects to US$284 billion. Municipal Solid Waste (MSW) accounted for the largest share of projects by feedstock type in the past week, with an annualised figure of just under 3.1 million tonnes. The USA was the leading country in terms of projects, followed by the UK, Indonesia, Canada and China. AcuComm’s Sales Package is the most comprehensive and accurate source of ‘live’ practical sales information regarding the Renewables & Energy from Waste markets. With unlimited downloads of project data and contact information, this package will provide your sales team with a ready-made pipeline to access as and when necessary. Take a look at this week’s latest projects by clicking here. This week, AcuComm’s most popular report was our latest edition on Biomass in South East Asia! AcuComm’s latest Business Report on Biomass in South East Asia shines the spotlight on the vast and developing biomass, renewables and energy markets in the area. To find out more and to purchase your copy, click here. AcuComm’s latest Business Report is out now! 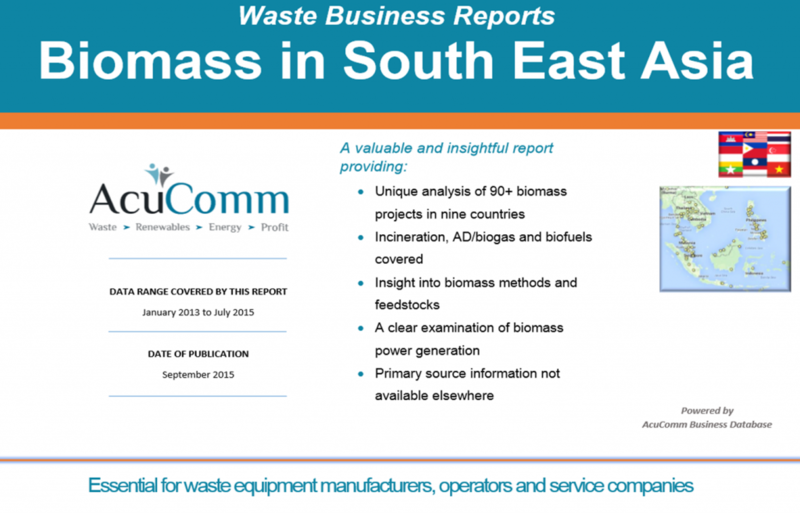 AcuComm’s latest Business Report on Biomass in South East Asia is out now. 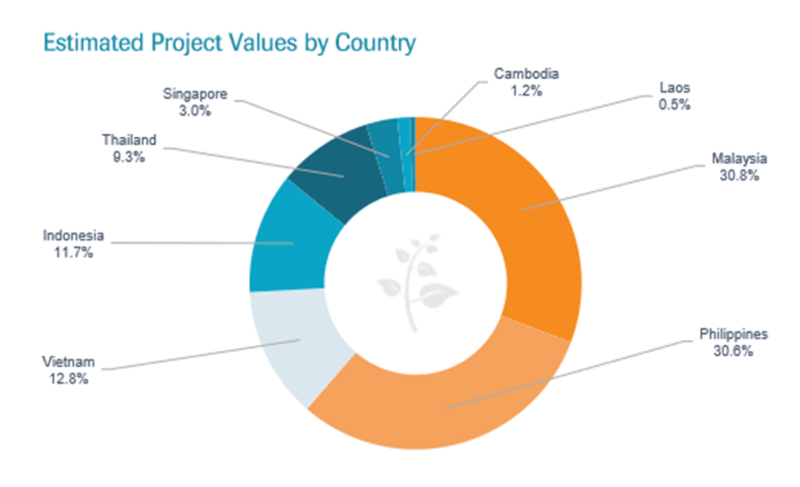 This report provides valuable information on over 90 biomass projects from across South East Asia, as well as giving an insight into the methods and feedstocks involved. Once work starts, the average project takes around 18 months to become operational. Most however, have on-going operational requirements for much longer. Investment in Indonesian biomass is concentrated in the more developed west of the country, although a few projects are appearing further east, driven by rising local power generation needs. Projects in Malaysia focus on palm oil, a principal agricultural crop. There is a great deal of interest in using waste from this to create power and biofuels. Boosting power generation is a key concern of the Philippines government, and biomass plants are seen as an important way to do this. Biomass projects in Thailand focus on incineration of a range of agricultural and food-related feedstocks. South East Asia represents a rapidly-growing market of 630 million people, and this economic development brings with it the need for greater and more economical power generation. AcuComm’s Business Report provides you with in-depth market analysis on key Renewables & Energy from Waste project sectors that you won’t find anywhere else. To find out more about opportunities in the South East Asian Biomass-to-Energy sector, and to gain real-time insights into the size and scope of investments, click here. In the week ended 20th September 2015, AcuComm added new or updated projects to our Business db database, worth an estimated US$4,125 million and reported waste capacity of 2 million tonnes. This takes the total estimated investment value of projects to US$283 billion. The USA, China and the UK were the leading countries from the past week. This week’s average waste project was worth US$84 million. With AcuComm’s Sales Package, your team will be able to filter projects by location, waste type, feedstock, etc. and access direct contact details for developers and contractors that will save you time and money. For more information on any of our packages, click here. This week’s most popular Business Report was MSW incineration. For a clear, fact-based and practical assessment of the health of the MSW WtE sector based on real projects and not market estimates, look no further than this report. To explore the trends and developments from this sector, purchase our unique report. In the week ended 13th September 2015, AcuComm added new or updated projects to our Business db database, worth an estimated US$2,578 million and reported waste capacity of 3.5 million tonnes. This takes the total estimated investment value of projects to US$281 billion. WtE incineration was the largest project in terms of both waste capacity and power generation. The leading country in the past week was the USA with 10 projects, followed by the UK, Sweden and Australia. AcuComm’s Sales Package is the only source of ‘live’ practical sales information for Renewables & Energy from Waste projects worldwide. Put our database to the test by arranging a demo here. This week, our most popular report was our country focus on China! 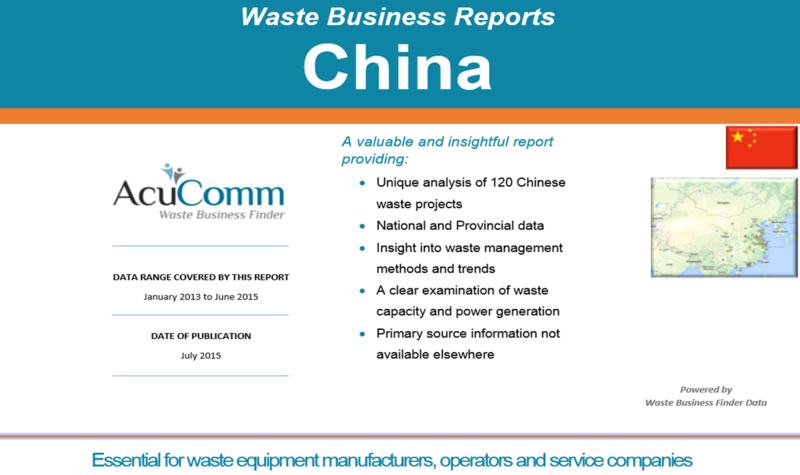 AcuComm’s Chinese Business Report explores the key interests of the country’s waste industry, as well as the technologies and treatment methods that are experiencing the most investment. By combining the most recently published data on Chinese waste generation with project information from AcuComm’s database, we can provide a rounded overview of the country’s Renewables and Energy from Waste market. In the week ended 6th September 2015, AcuComm added new or updated projects to our Business db Database, worth an estimated US$3,155 million and reported waste capacity of 3 million tonnes. This takes the total estimated investment value of projects to US$313 billion. The leading country in terms of projects in the past week was the USA, followed by the UK and China. This week, the average project was worth US$91 million, but naturally, there will be variations due to value, size, duration and complexity. AcuComm’s Sales Package will provide your sales team with all the information they need to identify and engage with the projects that matter to your organisation. Click here to take a look at the latest Renewables and Energy from Waste projects in the AcuComm database. 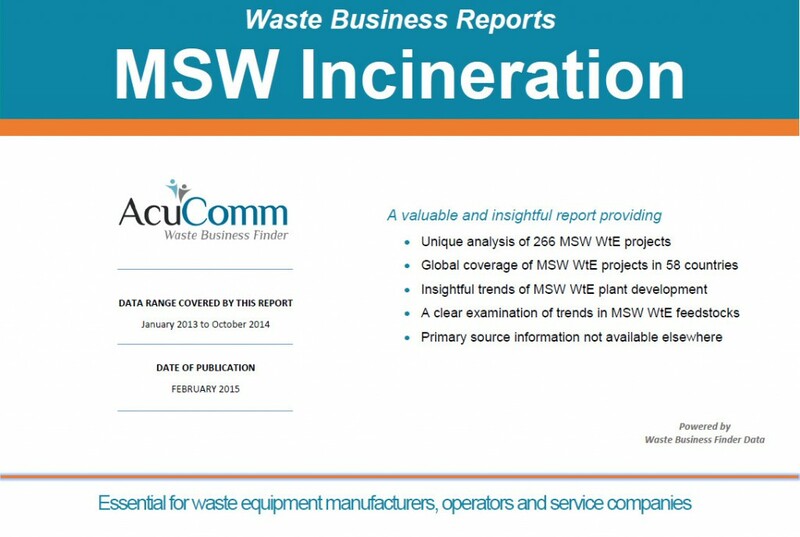 Making it three weeks in a row, our most popular Business Report was MSW incineration! AcuComm’s Business Reports are an unparalleled source of information that focus on sector analysis and are critical for any business selling into the Renewables & Energy from Waste industries. Subscribe to our Business Reports here. Municipal Solid Waste accounted for 46.6% of waste capacity in projects covered in the Business Finder database in June 2015. WtE incineration, whether standalone or as part of an integrated facility, continued to dominate the reported power generation of projects in June 2015. AcuComm’s Executive and Strategic Packages will provide you with key market analysis on the renewables and energy from waste project trends each month. AcuComm’s db Monitor is the only source of this data and is essential for manufacturers, operators and service companies involved in the renewables and energy from waste industries.